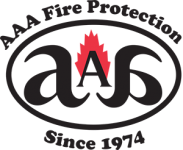 For Hayward fire suppression services, local businesses turn to AAA Fire Protection Services. As a leader in the fire protection industry, we provide expertise in helping businesses like yours comply with fire protection codes. We offer complete fire protection services, including fire sprinkler services. As a team of professionals, we work seamlessly with your building team, architect, or design team. We work on new building construction projects as well as projects that involve renovations. We make it easy for businesses like yours to remain 100 percent compliant with governmental fire code. We began our fire sprinkler services by offering complete fire sprinkler installation services. That includes identifying the unique characteristics of your building and providing a comprehensive plan that offers the maximum fire suppression capabilities. In addition, we go beyond just fire sprinkler installation services. We also offer fire sprinklers inspections, which helps you stay in compliance with fire code. By testing your system, we’re able to determine its functionality. If we detect broken sprinklers, our fire sprinkler repairs team quickly makes repairs and keeps your business protected. For free quotes or if we can provide answers to your questions, just give us a call at (800) 543-5556.